Being a bride is simply the best! 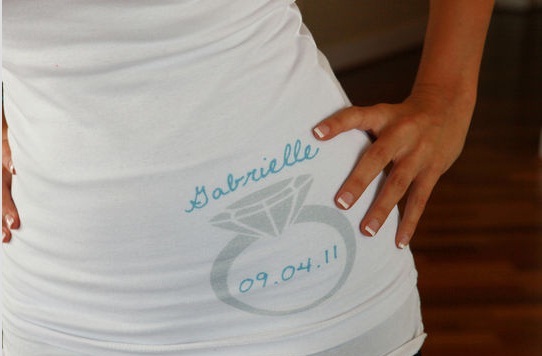 Why not celebrate the occasion with custom t-shirts? Bridal Party Tees has a variety of styles, colors, fonts, and art that allow you to create a one of a kind piece that you’re sure to love. We have bridal apparel that is great before the wedding, after the wedding, and even shirts for the honeymoon! Don’t forget you can add rhinestones for an added touch! Already happily married? We have anniversary shirts! Browse our gallery and create one of a kind bride shirts today! I am always looking for something fun and unique that could be used for that “something blue”. If your wedding colors have blue in them, then you are golden. If not, it can a quite challenging thing to find. That is why I like these little hot shorts! They are a great take on the “something blue”. It is different, fun, and best of all it is worn under the dress so it will not clash with your wedding colors! Wouldn’t these be great to surprise your groom with after the wedding too? I love them! Check it out! Most couples look forward to their honeymoon with wide-eyed anticipation, awaiting a night of fiery passion and picture-perfect romance that would put any Hollywood chick-flick to shame. In pursuit of this lofty goal, couples book breathtaking week-long getaways in exotic places like Hawaii or the Caribbean. And, in most cases, these romantic excursions deliver the goods. Lots of romantic moments, special memories, and pictures that bring the memories from the fleeting present into the distant future. Unfortunately, not every place can produce such memories. There are some places you should never go on a honeymoon, and this article profiles 10 of them. While an exception could be made in the case of a couple that is very outdoorsy and adventurous, 9 women out of 10 will not go for this on their honeymoon. To understand why, try putting yourself in their shoes. Many women dream about their weddings and honeymoons, and envision them as paragons of romantic bliss–as well they should be. That being said, most women don’t find it very romantic to be putting together their beds by hand, pitching tents, and creating warmth by burning logs. They envision candlelit dinners, not firelit dinners. Therefore, skip the camping trip for now and save it for a bit later, when it is more appropriate. It’s generally not safe to vacation in uncivilized places or countries that are plagued by lawlessness, political unrest, disease, unsafe terrain, and the like. This becomes even more obvious when you’re talking about where to take a honeymoon. Think about it: You might have done a Google Image search on some remote destination that looks great from the comfort of your living room, but what could be worse than a honeymoon that gets ruined by sickness or even gang violence? Laugh now, but realize that these things do happen in certain parts of the world – and avoid them for your honeymoon! Use common sense here. No girl ever grew up longing for the day when she could take a honeymoon in Kansas, Nebraska, or someplace equally boring (no offense to Midwesterners, of course). The simple, peaceful life has a lot to be said for it. However, it’s just not the picture of romance that most women or men envision for themselves. Therefore, steer clear of any obviously boring places and opt for somewhere a bit more fun or exciting. It happens; couples can and sometimes do have radically different ideas of what their perfect honeymoon means to them. Maybe you want to see the ancient Greek ruins, while your new bride wants fun in the sun. Clearly, you need to reach some kind of agreement so one of you doesn’t remember the honeymoon as a pride-sucking compromise. The goal is to enjoy yourselves, after all! The best solution is to pick somewhere that offers something you both want. Put some serious thought and discussion into what each of you are looking for and make a point of finding somewhere that makes you both happy. A big part of the honeymoon appeal is the “getaway” element; the idea that you are going somewhere far away from your everyday life to celebrate your love together. For this reason, going somewhere close to home can be a real downer. If you live in Connecticut, what’s the excitement in honeymooning in Massachusetts? You guessed it – none! To avoid this trap, try to vacation somewhere a bit further away unless you and your bride truly want to go somewhere close. Nothing kills a honeymoon faster than when one spouse feels compelled to micromanage everything (i.e., eating at 9AM, scuba diving at 11AM, sightseeing at 1PM, etc). The fun of a honeymoon is that the two of you can spontaneously enjoy yourselves, whatever that may entail. Therefore, try to avoid trips that are highly scheduled and require you to do certain things at exact times. It will make everything more loose and fun. Some spouses (particularly husbands) actually try to cram a business trip and a honeymoon into one! It should go without saying that this is a very unromantic thing to do. You have just been married and the sole focus of your trip should be on togetherness and fun with your spouse. Do both of you a favor and leave business and work behind for a week or two! Tourist areas are not always a smart choice for honeymooners. Even if you both want fun in the sun, somewhere like Miami Beach that’s crawling with tourists and kids may not be the most romantic setting for you. Instead, find more remote places that cater to adults. Another option is to hit the touristy spots in the off season when you’ll less likely be bombarded by large crowds. The idea is to cut down on distractions and just enjoy being with each other. 9. Anywhere with your in-laws. Believe it or not, some couples think it’s smart to invite in-laws or other family members along to build a sense of bonding with their new family. 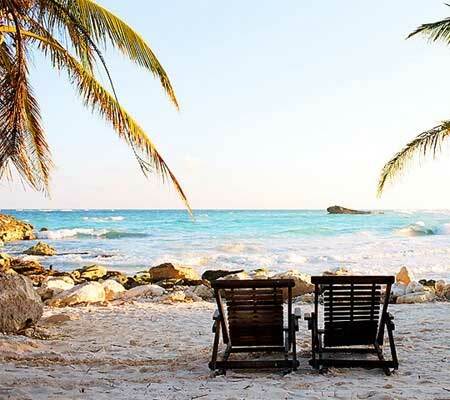 While this might sound good to some people, it often spells disaster for honeymoons. Again, the whole idea is to celebrate your new love together. This is only made more difficult by other people and their own ideas about where to go, what to see, where to eat, etc. It’s better to just leave them out of the equation. 10. Anywhere you haven’t thoroughly researched. Sadly, some places look good from the pictures but don’t actually deliver when you arrive. You don’t want to show up to some hotel or resort to find the place dirty, the staff surly, or the surroundings lacking the right ambiance. Thankfully, the Internet makes it possible to avoid this outcome. Sites like TripAdvisor.com make it extremely easy to find out what past travelers think about your chosen destination. Do your homework and you should have a great time! Are you looking for something to make your wedding night extra special? Well our personalized underwear is just the thing. Whether it is a bride set or a completely personalized saying of your own, these undies are unique and sure to grab his attention. Plus our personalized Mrs.____ collection is a new and fun way to show off your new name to the one you love!